cryptonaut-in-exile: The Seeds of Doom - "What do you do for an encore, Doctor?" "I win." The Seeds of Doom - "What do you do for an encore, Doctor?" "I win." Four is very shouty and runs around with a pistol in hand more than you'd expect in this one. 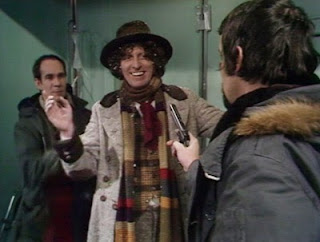 Of course, as Sarah Jane points out, he'd never use it. "But they don't know that." It's a strong story in terms of building tension, energetic performances, and use settings to keep things interesting. 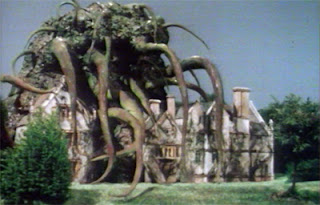 It moves from the stately home of an eccentric (at first, by the end we realize he's utterly mad) plant enthusiast, to Antarctica, and back again for the big finish. That kind of globe-hopping and variety is welcome and appreciated. Also, it's hard to go wrong with Four and Sarah in any story, and apart from the UNIT personnel suffering by the lack of familiar faces (this is another where Courtney wasn't available to play the Brigadier, so we get some stiff in the leadership role), the supporting cast is quite good. We've got the mercenary Scorpy running around being as menacing as human in the run of the series, and Chase, whom Scorpy serves, is a memorable villain. Memorable, but problematic in a couple ways. 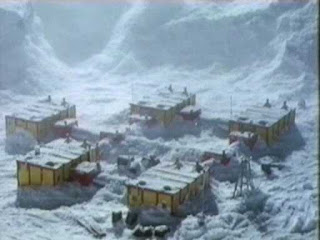 The Antarctic base is actually a great setting in this story. Chase is a sick twist, a Bond-style villain as megalomaniacal as they come, but his character, specifically his fanatical tree-hugging mentatlity valuing plant life over human life is puzzling. At first his screed against bonsai makes one wonder if he's having a lark, but no, he's deadly serious and we have to wonder: why this villain and this type of alien invasion? Is Chase just a necessary human agent for the Krynoid, and written to be a deranged plant lover to make his affinity for his would-be plant overlords somehow plausible? If so, well it's all just a bit too silly. Or, is he meant to be a representation of a foolish ecowarrior mentality and the Krynoids plants to highlight how that kind of insanity could destroy human civilization. If so, well then it's worse than just silly, it's reactionary and regressive. I suppose it's possible it's all just a mush of stuff developed by committee with no holistic vision guiding the thing, in which case, it's unpalatable thematic mush. Chase has Sarah in his clutches for a bit of experimentation. If we don't question the whys and wherefores of Chase, but just accept him for the villain he is, then I think we've still got to overcome his methods as being questionable in the context of the show. Four people are thrown in the hopper of Chase's composter in this story, and two of them, including Chase himself, wind up plant food. That's pretty grisly. Now, mercifully, no attempt is made to spray blood all over or be otherwise graphic about it, but that sort of grisly end feels more horrific than is, strictly speaking, necessary for what is still a show for kids. Scorby menaces the Doctor. Who doesn't seem to mind. Is it hypocritical to be tolerant of seeing Daleks blast people to irradiated skeletons in other stories but not to be OK with henchmen and villains being dispatched by a meat-grinder here, where we don't even see the grinding happen? I'd argue the former is more fantastical, and the viewer understands that the Daleks, the agents of the destruction, are inhuman monsters, but in this story the violence is engineered by a human -- sure, he's a nasty villain, but that he relishes the horrific nature of that sort of death also introduces an element of torture that less cartoonish than the the other sorts of deaths we tend to see in Doctor Who, so there's a difference in degree and a difference in kind between the two sorts of deaths. That all said, this is Hinchcliffe-era gothic horror though, so we expect the situations and the deaths to be more frightening. I saw this as kid and wasn't scarred for life or rendered psychopathic by exposure to it, so I'm not arguing it's inexcusable. My kids are seven as I write this and I can't say I'd be eager for them to watch it, because I'm not sure how they'd react or how we'd discuss the sort of violence depicted in this story. With a twelve-year-old it's probably different and the discussion about depictions of violence is probably easier to have. That's one thing that makes the series fascinating though. It's ostensibly a kids' show, but it's so much more clever than most, and yet while adults can and do enjoy it, it's clearly not a show that's for adults. To call it a "family show" would also seem to miss the mark, although that's probably more a problem with how we think of that label than with the show which, I think, is truly one that is balanced in such a way that kids to grandparents can enjoy it. Indeed, some of my fondest memories of watching the show are of being middle-school aged watching it on Saturday nights with my late grandmother, our weekly ritual. We watched all the Pertwee, Baker, and Davison eras together ... even some of the Colin Baker era, although neither of us enjoyed the show very much at that point. So, despite my reservations about it's appropriateness for the youngest of fans, for all the ways this one does work well it's essential viewing from one of the series' best seasons.